Castlecroft Group are a multi-faceted group involved in letting commercial property in Perth and Dundee. They have three self-storage centres currently and are looking to open more in the future, as well as a construction services division providing site accommodation, chemical toilets and welfare to constructions sites and events. I am not a member of the Black family but was employed by our chairman, Ian Black, in 1995 as Office Administrator, and my role evovled over the years until I became MD in 2007 and Ian took up the position as chairman but I am a member of the Castlecroft family. What Values Are Important In Your Family/Family Business? Respect for everyone, its teamwork! 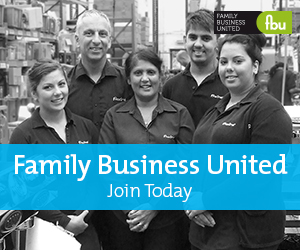 What Is The Best Thing About Being A Family Business? Mmmm, I don’t think there is a worst, as with all families there are good days and some not so good, as long as you can sort out all problems before they become major issues then life is good. What Is The Best Thing About Your Working Day? Variety, I can start the day with a plan but 10 minutes in something happens and its all change. What Is Your Proudest Family Business Achievement? Successfully getting through the worst recession of our lives and using that full experience to push the company onto bigger and better things. Is There A Next Generation Waiting In The Wings To Take Over? Yes our 3rd generation has taken on the role of General Manager and Jordan is working closely with me as my successor. He has some time to get there yet, but the plan has been actioned. What Do You See As The Biggest Challenge Facing Family Businesses? Ensuring that everyone works to their full potential and always for the best of intentions. What Words Do You Associate With Family Businesses? Integrity, determination, hardwork, long hours, benefits, success, fun. Words Of Wisdom – What Piece Of Advice Would You Pass On To Someone Thinking About Joining The Family Business? Learn to evolve, adapt and move with the times both as a person and as a business.